The Bank of Japan can choose to delay stimulus by a few more months, as it did on April 8, but it can’t altogether dismiss the growing calls to ease monetary policy. The central bank’s policy board has decided to continue with 80 trillion yen a year ($666 billion) bond-buying programme and says the economy “is expected to continue its moderate recovery trend.” That sanguine assessment is at odds with the Breakingviews Abenomics Index reading for February. Rising stock prices were the lone bright spot in that gauge. Leave them out, and Prime Minister Shinzo Abe’s anti-deflation campaign appears to have hit stall speed. 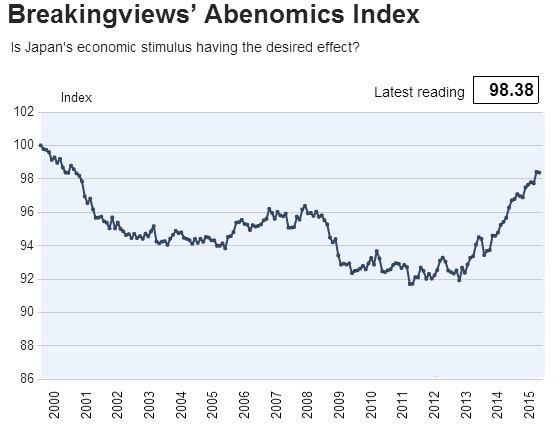 An original architect of the Abenomics campaign, ruling party lawmaker Kozo Yamamoto, said earlier this month that doing nothing “isn’t an option for the BOJ.” Consumer spending is weak, and large manufacturers aren’t in a mood to invest. A return of deflation could undermine the BOJ’s credibility. Monetary inaction looks too dangerous to last for long. The Bank of Japan left its 80 trillion yen ($666 billion) a year bond-buying programme unchanged in its April 8 monetary policy meeting. The economy “is expected to continue its moderate recovery trend,” the BOJ policy board said in a statement.